Are you waiting for search engines to crawl your new web blog post to index in a search engine With the help of ping website tool is very easy to use and helps to index faster in the search engine? When a new blog post in pinged, it notifies multiple servers to index the new blog content from a particular site. The tool which we developed uses the same procedure to ping automatically all different server one after another. Some Seo marketers request subscribers to enter an email and send periodically new blog post every time they write. Optimizing the content of a website according to the algorithm of a search engine is the objective of every digital marketer. As the need for digital marketing is increasing, new strategies for staying ahead in the competition are coming to existence. Once a new piece of content is uploaded on a website, it becomes important to inform the search engine to detect it and optimize the website rank accordingly. For this purpose, XML sitemap, robot txt generator and ping website types of tools are used which are available online. 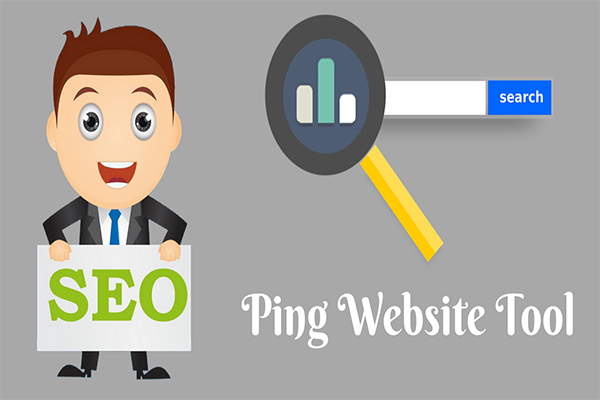 This article is all about the working of a ping website tool and its importance for the ranking of a website. When you ping a website, it works similar to a backlink. The main purpose of the ping tool is to help the search engine in detecting the web page faster. Although ranking depends on the quality of content, ping tool helps a targeted webpage to come in the approach of crawlers. If the content of that page is well optimized according to the latest parameters of Google algorithm, your website will automatically get a better ranking than other competitors. Now the question is, What actually ping is? In simple words, ping is a testing method to confirm that your computer system is connected to a server. You may consider it as echo system like sonar in which signal is sent in the form of data packets to the search engine. If you receive data packets back, it means you are connected to a server. From the perspective of the search engine, it can be concluded as a signal to search engine from your particular web page. When the server receives the ping, it sends pong in return. If any new content with backlinks and sitemap is updated, crawlers automatically detect and it finally helps in indexing a website. The ping servers contain multiple programs with a known number of ping sites to ping blog contents and help the search engine spiders to index quickly new blog post. What does the Ping website tool mean? After understanding the working of a ping test, you must be curious about how to execute it. One can find an answer in online tools that are specifically meant for pinging. There is no need to download & install any application. You just need to open the website, enter the desired URL execute ping test. There are some great online portals that can help you in ping testing. These are some websites with high domain authority and Alexa ranking. You may also find many other options in this category but they are the best one. Why do we need a Ping Website tool? Every online portal whether it is a website or blog comprises multiple pages meant for display different information. Some pages are deleted and some are newly constructed. For better indexing of a website, it is important to draw the attention of FGoogle crawlers towards new web pages. It works with the help of a ping tool. The crawlers sometimes miss the new pages that result in poor indexing. If you manually instruct the search engine’s server to detect a website or its page, the results will be instant. For this purpose, the ping tool also requires the help of XML sitemap file. A webmaster updates XML sitemap file in the root directory of a website. This sitemap contains the addresses and bookmarked links available on every page. After successful submission, the next step is to inform the crawlers to crawl over the targeted web pages. When you ping the URL of your website, the server sends back data packets as a response signal. It establishes a connection between host and server which is essential for better indexing according to new keywords and backlinks. The ping tool was basically made for bloggers because they update new content more frequently. Rather than a product or service, their business totally depends on the information available at a specific page. The bloggers may create informative as well as entertaining content, but how to increase its reachability to the desired readers? When a new page is updated in a blog, its quick indexing is essential. For instance, if an online game is getting viral all over the world, people curiously show interest in gaining more knowledge about it. Blogs the best sources of information if they are organized by a good blogger. After preparing a complete page of information, they update and wait for the response of visitors. Better and quick indexing means more visitors which is ultimately beneficial for your business. Although it is a beneficial tool for bloggers, website owners can also gain its benefits. Websites also need fresh content from time to time. After updating new info in an existing page or on a new page, it is important to inform customers regarding this stuff instantly. For this purpose, a ping tool can help. Here are some benefits that one must consider to read. 1. Ping helps in being sure about the network connectivity. When it comes to the testing of a website, the tool helps you identify the reachability to a server. If you receive a pingback from a search engine, it means you are well connected to the server. 2. The time is taken for reaching the data packets of a ping test to the server and its response back in milliseconds can be identified with the help of a ping tool. This is helpful in resolving the network path issue. 3. One can also figure the efficiency network in a specific region with the help of a ping test. It is measured by the number of packets during the sending & receiving process. 4. It invites the search engine to crawl on a web page in order to detect backlinks and targeted keywords that help in improving the ranking. How does Ping website tool work? The ping website tool is very convenient to use even without requiring any digital marketing knowledge. Different websites have different functions of ping testing. Some of them just ask for the website URL and its category to execute the command. On the other hand, some of them require details with more depth. If you want to ping a website with complete details, here is a process to follow. 1) When you open the ping testing website, it will show an online form to fill. In the first section, type the blog url. 2) The second section requires a web address. Here you need to enter the name of the blog page. 3) The next section will ask you to update blog url to ping. 4) If there is also an RSS of your site, enter it in the fourth column. 5) Finally Re-check all the information updated on online ping website tool, like blog URL, blog name, blog update URL and RSS URL in respective boxes. It is advisable to select an online tool that automatically detects the service type. Once the process starts, it automatically starts pinging all relevant links to provide you successful results in return within just a few seconds. 6) Enter the captcha code in the given box. Then click the submit button to ping your blog. Using ping website tool is one of the best practice to index new blog content as soon as possible by pinging the various site and inform webmaster indirectly to index the URL. If you compare webmaster and ping blog tool, it will only index 500 URL's / month. But, the tool will index n number of blog URLs. The main advantage of the ping tool is its compatibility with multiple search engines. It is capable of alerting all search engines at once after executing the process. The crawlers automatically detect the ping address and go through the entire web page to identify new backlinks that are necessary to better ranking at the search engine. In short, it is a very helpful too if you are a search engine optimization expert. Due to some network path issues, sometimes, the website takes much longer time than expected to load & respond back to the server. The ping test tool can help in identifying the path so that the web developer can resolve this issue. It is a powerful tool for monitoring different websites & network devices for quick indexing. When the ping informs a search engine about new activity on your websites, a maximum number of bots gets activated and start crawling in order to obtain the updated data that finally beneficiate the website by improved ranking. The online tool of pinging websites is totally free of cost and most of the portals allow you to ping a 1 blog URL. It is highly beneficial for digital marketers but the user must utilize the services carefully. Pinging a website more than once is unethical from the perspective of a search engine. The bots of search engine consider it as spam that sometimes ignores the newly updated content or also block the website. For the better ranking of a web address, an SEO expert needs to be up to date with every small & big information. It is a set of different strategies. If all strategies will not be organized perfectly, it becomes difficult to achieve the core objective. It is advisable to check the entire website’s SEO thoroughly before pinging for obtaining better indexing results.